Decorex Durban 2014 drew to a close with visitors across the board agreeing that, once more, the Decorex team had put together the most comprehensive and stylish décor, design and lifestyle exhibition. Decorex Durban took place at the Durban Exhibition Centre from 20 to 23 March and played host to more than 17 000 décor savvy visitors. The show saw the launch of the 2014 Decorex SA theme of Design Your Life – inviting visitors to find their own style instead of slavishly following the latest trends. Setting the scene on the 20th March was the first in the Decorex series of trend talks by leading trend analyst Dion Chang and made possible by KSA member Caesarstone. The 2014 Design & Trend Forecast series is running alongside the Durban, Cape Town and Joburg exhibitions and also features a report back from Eurocucina by Franklin Till. Durban design duo Urban Lace were invited to interpret the show theme of Design Your Life, with an entrance feature that would reflect contemporary trends and how to make sense of them. Chantelle Moss and Sarah Reynolds said their answer was always to be mindful of the context we live in and the surfboards, hats and a bicycle on their installation created a laid back and relaxed, truly Durban-styled space. It was a veritable feast of design at Decorex Durban this year, with interior designers and landscapers taking part in two of the group design installations. At the Belgotex Trend House, five local design stars created rooms showcasing their own style but also the very latest in flooring trends. It was a true “World of Choice” as Paige Waplington from Redesign Interiors, David Malcomess from Oyster Furniture, Vinesh Maharaj from Kitchen Spectrum (a KSA member), Di Hirshowitz from Brushwood Basics and Bianca Shaw from Slinx collaborated with Belgotex to create the house that dreams are made of. KSA members excelled in the stand awards with every member exhibiting receiving a mention. 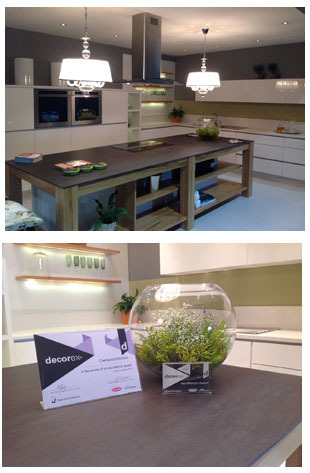 Special mention must go to Crestwood Kitchens who received an excellence award for their elegant stand.